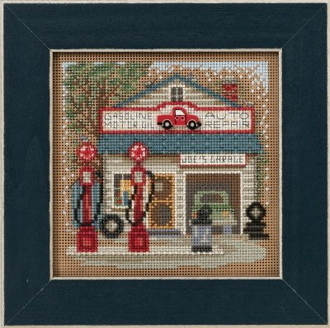 A vintage inspired themed kit depicting Joe's Garage with old time gas pumps. Adorn with the enclosed Mill Hill ceramic Truck button. Design size: 5" x 5" (12.7 cm x 12.7 cm). Frame sold separately, see item 40-131 Matte Blue frame (GBFRM2).